Being tough on your phone is probably the biggest issue for most men. We work and play hard. I have been in search for a decent tactical phone case for my iPhone 7 plus that would protect my investment. I planned on paying $70 on something and figured that it was worth the money. Luckily, I think I have found something for under $20! 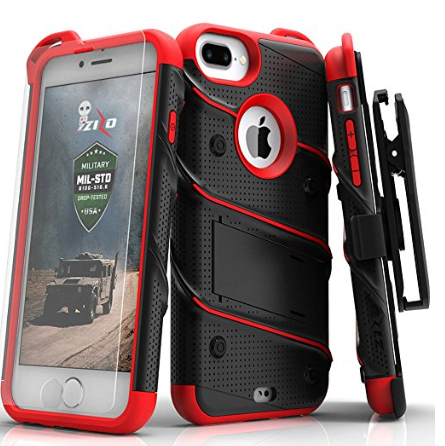 The tactical iPhone 7 plus case I will be reviewing today is called the Zizo Bolt Series. They come in many different colors which you will see samples of throughout this article. I ended up with the Red/Black to support my kids sports team. My case had a deliver time of 2-3 window. It showed up earlier than that at around a week. The aggressiveness of the colored lines on he back do not stick out as far as I thought they would. That’s a good thing. The glass installed much easier than expected. I may have gotten lucky but it went right into place. One tip is to make sure you get EVERY little thing off your screen before installing. If not, you will get bubbles and will not be happy. As for he case itself: I really, really like it, but I’m not completely sold on a couple things that I list below. The belt clip does look very nice but the I’m not sure it is made to take abuse. I would not use it at work. I’m not sold on the lanyard. Just not my cup of tea. The only time I could see myself using it is if I was outdoors and didn’t have pockets. Since I have an Apple Watch, don’t see myself using it much. I may, but I’m sure the lanyard will be nowhere to be found by that time… in any case I knew that before my purchase. My 7+ fits very snug and all buttons work as expected. I like the feel and look. I was looking for a tough case that was not bulky. We love the protection of the Otter Box but I hated the bulkiness. I also purchased one for my son’s iphone 6 and it fits just as good. Time will tell if this protects my phone like so many people claim. I do wish the outside was more rubberized, It would make me feel much better in the hands. Pros: looks good, decent space between phone screen and outer front of case (face plant protection), comes with tempered screen, shipping time decent for non Prime, phone stand, not bulky, price compared to Otter Box (if it really protects against decent drops). Cons: belt clip not made for abuse, not rubberized on the outside of the case and corners. It’s going on about four months since I have started using the Zizo Bolt Series iPhone case and gotta say, it is holding up well. My phone has taken a couple drops from waist high. I have not had any damage. The screen glass that came with it is still in tact with no cracks. I have not been using the belt clip, just not my cup of tea. The phone proper-upper gets much easier to open after it breaks in. I’m getting more use out of it than I expected. It’s kind of nice! Finding a raccoon proof trash can be a pain in the you know what. Finding one that actually works is even harder. There are only a couple on the market that claim to keep raccoons out of the trash but most fall short. Raccoons are smart little critters and always seem to find a way to get into the trash. We are going to cover the best raccoon proof trash cans along with DYI instructions for those of you that would like to make your own. The first raccoon proof trash can is the “The Animal Stopper” by Rubbermaid. This is a 32 gallon outdoor trash can that locks with a device built in to keep the handles locked tightly. It is a pretty basic looking garbage can so it doesn’t stick out like a sore thumb. The customer reviews seem to point out that this device seems to work well in most areas. You can read all the customer reviews by clicking on the above photo. 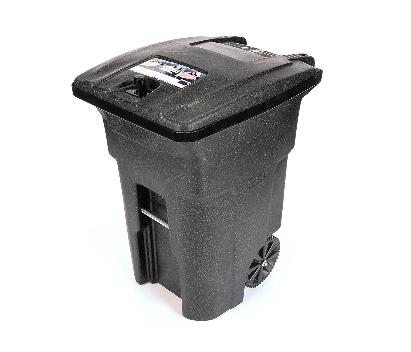 The price is very attractive and is the same or maybe even cheaper than regular outdoor garbage cans. 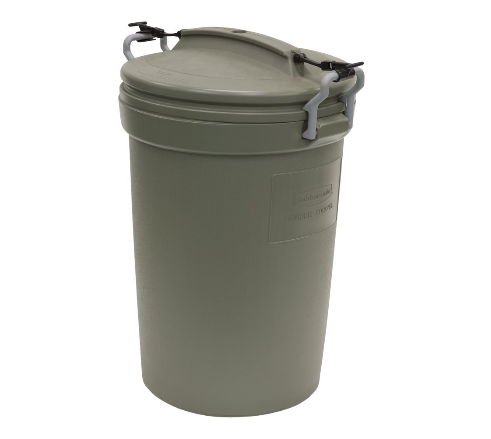 If you are looking for something tougher and want a bear proof trash can as well, check out the next choice. Next is the larger Toter animal proof trash can. This can is offered in 64 and 96 gallon options and also has the lift bar for trash companies that use the garbage truck to lift the can to empty it. Besides this trash can keeping out raccoons, it is also a bear proof trash can with the lid locking tight. The customer reviews on this raccoon proof trash can are very good. But, with the garbage can being larger in size and keeping out larger animals like bears, expect a larger price tag. You can see all the customer reviews here. 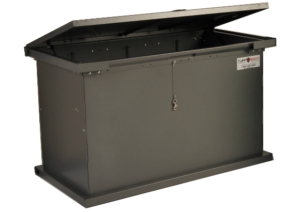 Our last choice for a raccoon proof garbage can is a trash bin or some call an outdoor trash box. These come in handy if you keep your trash cans in the garage but raccoons always do the break in when the trash is put out at the curb. An outdoor trash bin is not portable and is made to be kept out by the street. The trash company opens it and removes the bags. You can also expect a large price tag on these but depending on where you live, are worth every penny. It is a one time purchase that should last many, many years. It will defiantly keep the raccoons and bears out of your garbage. You can check out all the options at Amazon here. Before getting into raccoon proof trash cans DYI, I wanted to show just how smart raccoons are. If you have ever watched one, you will notice this. You will see their actions be very thought out and always knowing what is going on around them. I’m sure you have seen the mover the The Great Outdoors. That scene with the raccoons is priceless. Check out the video below and then we move on to raccoon proof trash can DYI. If the above options are not what you are looking for, you may find that adding a part to your existing garbage can may be better in your situation. This is good if you are trying to keep raccoons out of your garbage but not so much bears. The goal here is to make your own raccoon proof trash can. Use your drill and drill bit sized from instructions, drill two holes in the lid of your trash can. Using a Philips screw driver bit, attach the strap to your trash can lid. Take the strap you just attached, measure length don the side of your trash can and mark the didtsance with a pencil. Retrieve the receiver clips from your parts. Using your drill, attach the clip to the of your trash can. Repeat step 4 on the other side of your garbage can. Snap in the connections from the strap into the receivers. Pull on straps to make tight. You now have a raccoon proof trash can by DYI.